Rising temperatures are reducing ice cover on land, lakes, and sea and this is expected to continue. The Arctic Ocean is expected to become essentially ice free in summer before mid-century. Rising temperatures are reducing ice volume and surface extent on land, lakes, and sea. This loss of ice is expected to continue. The Arctic Ocean is expected to become essentially ice free in summer before mid-century. Nearly all studies to date published in the peer-reviewed literature agree that summer Arctic sea ice extent is rapidly declining,4 with even greater reductions in ice thickness5,6 and volume,7 and that if heat-trapping gas concentrations continue to rise, an essentially ice-free Arctic ocean will be realized sometime during this century (for example, Stroeve et al. 20128). 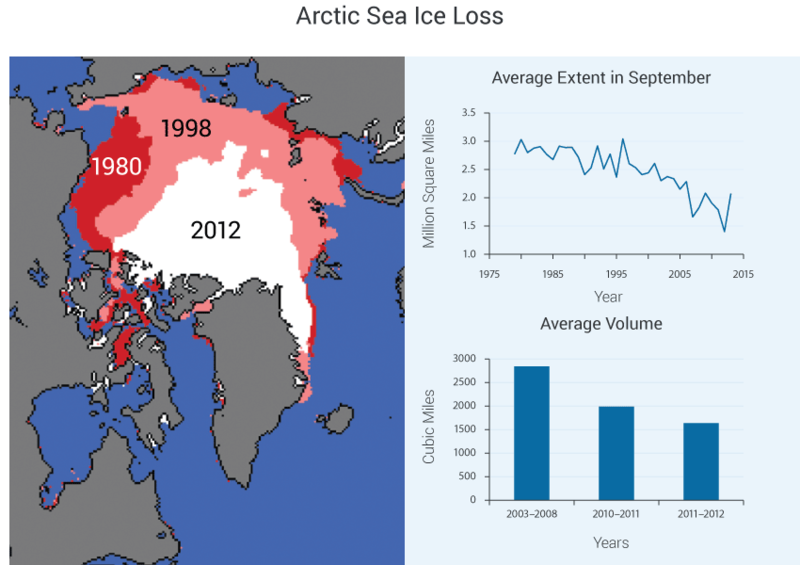 September 2012 had the lowest levels of Arctic ice in recorded history. Great Lakes ice should follow a similar trajectory. Glaciers will generally retreat, except for a small percentage of glaciers that experience dynamical surging.2 Snow cover on land has decreased over the past several decades.9 The rate of permafrost degradation is complicated by changes in snow cover and vegetation. The rate of sea ice loss through this century is a key issue (uncertainty), which stems from a combination of large differences in projections between different climate models, natural climate variability and uncertainty about future rates of fossil fuel emissions. This uncertainty is illustrated in Figure 2.29, showing the CMIP5-based projections (adapted from Stroeve et al. 20128). Viable avenues to improving the information base are determining the primary causes of the range of different climate model projections and determining which climate models exhibit the best ability to reproduce the observed rate of sea-ice loss. Given the evidence base and uncertainties, confidence is very high that rising temperatures are reducing ice volume and extent on land, lakes, and sea, and that this loss of ice is expected to continue. Confidence is very high that the Arctic Ocean is projected to become virtually ice-free in summer by mid-century. Rising temperatures across the U.S. have reduced lake ice, sea ice, glaciers, and seasonal snow cover over the last few decades.2 In the Great Lakes, for example, total winter ice coverage has decreased by 63% since the early 1970s.3 This includes the entire period since satellite data became available. When the record is extended back to 1963 using pre-satellite data,16 the overall trend is less negative because the Great Lakes region experienced several extremely cold winters in the 1970s. 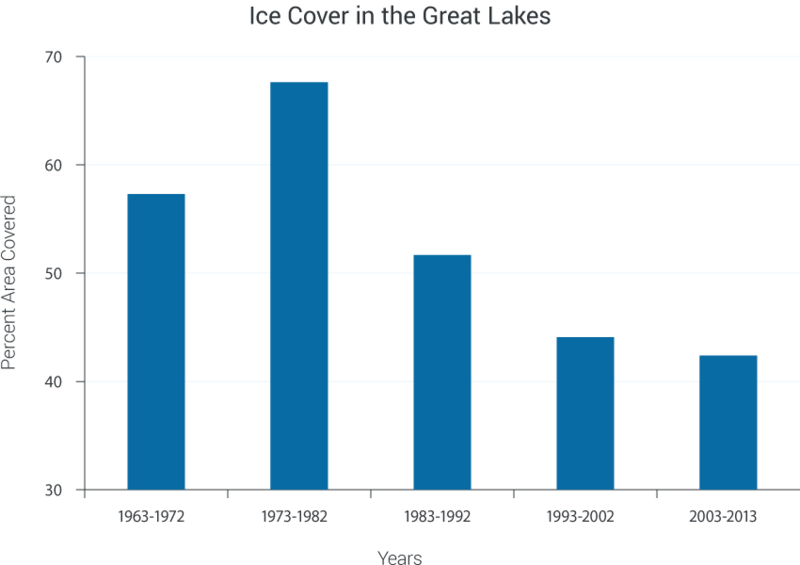 Figure 2.27: Bars show decade averages of annual maximum Great Lakes ice coverage from the winter of 1962-1963, when reliable coverage of the entire Great Lakes began, to the winter of 2012-2013. Bar labels indicate the end year of the winter; for example, 1963-1972 indicates the winter of 1962-1963 through the winter of 1971-1972. Only the most recent period includes the eleven years from 2003 to 2013. (Data updated from Bai and Wang, 201214). The loss of sea ice has been greater in summer than in winter. The Bering Sea, for example, has sea ice only in the winter-spring portion of the year, and shows no trend in surface area covered by ice over the past 30 years. However, seasonal ice in the Bering Sea and elsewhere in the Arctic is thin and susceptible to rapid melt during the following summer. The seasonal pattern of observed loss of Arctic sea ice is generally consistent with simulations by global climate models, in which the extent of sea ice decreases more rapidly in summer than in winter. However, the models tend to underestimate the amount of decrease since 2007. Projections by these models indicate that the Arctic Ocean is expected to become essentially ice-free in summer before mid-century under scenarios that assume continued growth in global emissions, although sea ice would still form in winter.8,20 Models that best match historical trends project a nearly sea ice-free Arctic in summer by the 2030s,21 and extrapolation of the present observed trend suggests an even earlier ice-free Arctic in summer.15 However, even during a long-term decrease, occasional temporary increases in Arctic summer sea ice can be expected over timescales of a decade or so because of natural variability.22 The projected reduction of winter sea ice is only about 10% by 2030,23 indicating that the Arctic will shift to a more seasonal sea ice pattern. While this ice will be thinner, it will cover much of the same area now covered by sea ice in winter. Figure 2.29: Model simulations of Arctic sea ice extent for September (1900-2100) based on observed concentrations of heat-trapping gases and particles (through 2005) and four scenarios. Colored lines for RCP scenarios are model averages (CMIP5) and lighter shades of the line colors denote ranges among models for each scenario. Dotted gray line and gray shading denotes average and range of the historical simulations through 2005. The thick black line shows observed data for 1953-2012. These newer model (CMIP5) simulations project more rapid sea ice loss compared to the previous generation of models (CMIP3) under similar forcing scenarios, although the simulated September ice losses under all scenarios still lag the observed loss of the past decade. 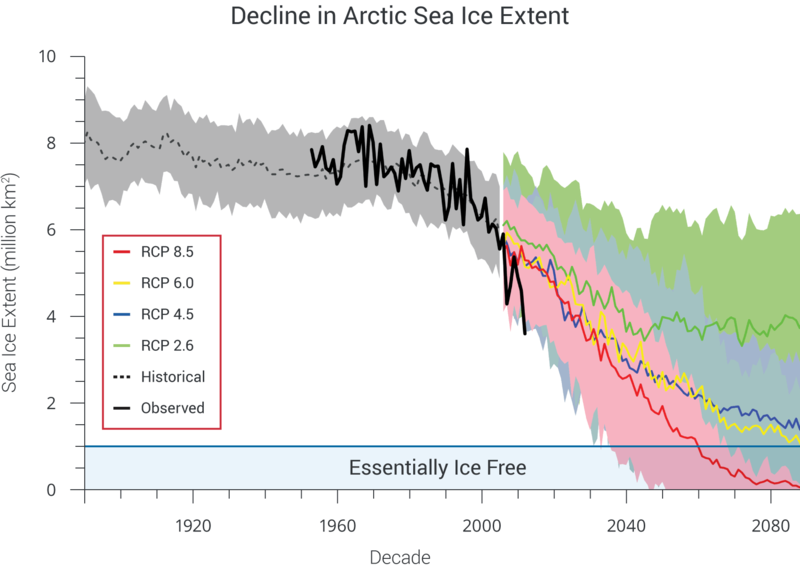 Extrapolation of the present observed trend suggests an essentially ice-free Arctic in summer before mid-century.15 The Arctic is considered essentially ice-free when the areal extent of ice is less than one million square kilometers. (Figure source: adapted from Stroeve et al. 20128). Snow cover on land has decreased over the past several decades,9 especially in late spring.28 Each of five recent years (2008-2012) has set a new record for minimum snow extent in June in Eurasia, as did three of those five years in North America. The surface of the Greenland Ice Sheet has been experiencing summer melting over increasingly large areas during the past several decades. In the decade of the 2000s, the daily melt area summed over the warm season was double the corresponding amounts of the 1970s,1 culminating in summer surface melt that was far greater (97% of the Greenland Ice Sheet area) in 2012 than in any year since the satellite record began in 1979. More importantly, the rate of mass loss from the Greenland Ice Sheet’s marine-terminating outlet glaciers has accelerated in recent decades, leading to predictions that the proportion of global sea level rise coming from Greenland will continue to increase.29 Glaciers terminating on ice shelves and on land are also losing mass, but the rate of loss has not accelerated over the past decade.30 As discussed in Key Message 10, the dynamics of the Greenland Ice Sheet are generally not included in present global climate models and sea level rise projections. Glaciers are retreating and/or thinning in Alaska and in the lower 48 states. In addition, permafrost temperatures are increasing over Alaska and much of the Arctic. Regions of discontinuous permafrost in interior Alaska (where annual average soil temperatures are already close to 32°F) are highly vulnerable to thaw. Thawing permafrost releases carbon dioxide and methane – heat-trapping gases that contribute to even more warming. Recent estimates suggest that the potential release of carbon from permafrost soils could add as much as 0.4ºF to 0.6ºF of warming by 2100.31 Methane emissions have been detected from Alaskan lakes underlain by permafrost,32 and measurements suggest potentially even greater releases from thawing methane hydrates in the Arctic continental shelf of the East Siberian Sea.33 However, the response times of Arctic methane hydrates to climate change are quite long relative to methane’s lifetime in the atmosphere (about a decade).34 More generally, the importance of Arctic methane sources relative to other methane sources, such as wetlands in warmer climates, is largely unknown. The potential for a self-reinforcing feedback between permafrost thawing and additional warming contributes additional uncertainty to the high end of the range of future warming. The projections of future climate shown throughout this report do not include the additional increase in temperature associated with this thawing.